Learn about subprime lending with iMinds Money’s insightful fast knowledge series. Originally, the term subprime lending described any loan that charged less than the prime, or base, rate of interest. This definition, however, has changed over the last 20 years to mean quite the opposite. Now subprime refers not to the interest rate charged, but to the credit worthiness of the loan taker. That is, subprime lending is any form of high risk loan. 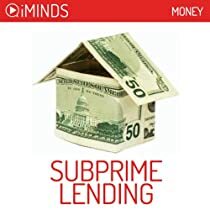 While the phrase subprime lending is typically used in reference to mortgages, the principle can be extended to any type of loan. This includes car loans, personal finance, and credit cards. It should be noted that there is no explicit cut-off between what classifies a prime loan from a subprime. Instead subprime indicates a broad range of loans that charge higher rates of interest to compensate the greater level of associated risk. Traditionally, loans were only issued to those people that had a strong history of repaying debts or were already in a financially stable position and hence were perceived to be of low risk. This practice left a lot of room for any who had poor or no credit history. To combat this deficiency, subprime loans were introduced as a way to extend credit to individuals who would not otherwise have been able to borrow money. Not only did this allow those people to improve their credit record, it also opened up a new market for high risk, high reward investment securities. iMinds will hone your financial knowledge with its insightful series looking at topics related to money, investment, and finance… whether an amateur or specialist in the field, iMinds targeted fast knowledge series will whet your mental appetite and broaden your mind.iMinds unique fast-learning modules as seen in the Financial Times, Wired, Vogue, Robb Report, Sky News, LA Times, Mashable, and many others… the future of general knowledge acquisition.